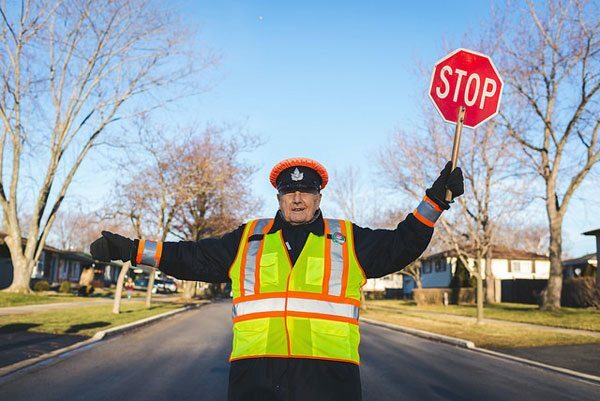 “Cyril the Crossing Guard.” Photo credit: David D.
Over the past year, NPQ has been following the progress of President Trump’s ostensible travel ban, which prevented the citizens of seven Muslim-majority countries from entering the US until internal policies relating to the information provided to customs by those countries undergoes extensive review. On Monday afternoon, the Supreme Court ruled that the White House will be allowed to enforce the ban until the final rulings on challenges to it are issued. NPQ’s Carole Levine warned earlier this year that the Trump administration was rapidly appointing judges to vacant federal court positions, which are held for life. She explained, “The conservative leanings of the source organizations that are recommending these judges and their support for…laws that influence how nonprofits sustain themselves should make who these nominees are a priority for the nonprofit sector.” That has become evident as the liberal Ninth and Fourth Circuit rulings are stymied by the conservative-leaning Supreme Court. Previously, injunctions related to the court challenges had allowed entry to people with “‘a credible claim of a bona fide relationship with a person or entity in the United States,’ quoting from a Supreme Court order issued in June concerning the second travel ban,” according to Adam Liptak at the New York Times. The “bona fide” distinction cause a wave of confusion, as people wondered what degree of family relationship would be deemed acceptable or how their employers would react. It opened the administration to waves of potential litigation on behalf of individual applicants. The Supreme Court’s decision will prevent many eligible people from reuniting with their families, resuming their studies, or taking up jobs. While this ruling will have devastating consequences for these individuals and the Muslim community at large, IRAP and our partners will not give up fighting until this discriminatory ban is blocked in its entirety.